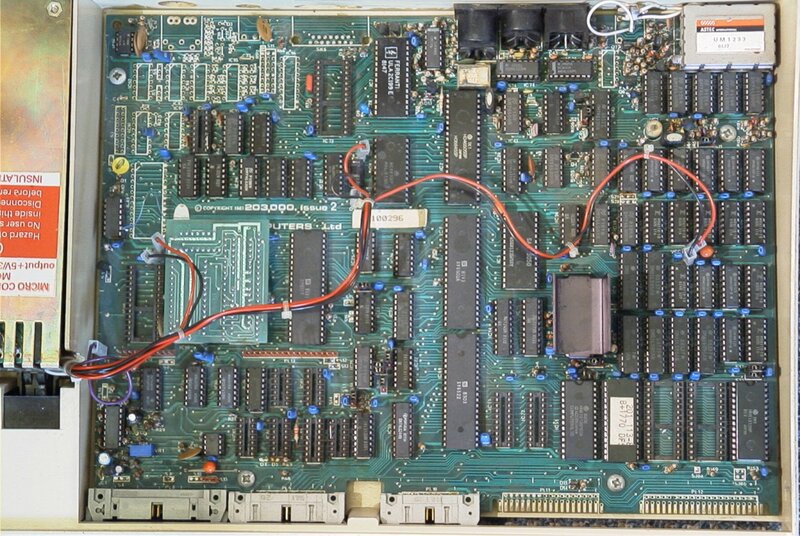 I'd like one assembled yes, i can source SID myself (i believe i have some C64C:s around). Just to show it works. A SwinSID nano (i.e. a modern SID remake) running on a BeebSID 2.4. I cant comapre it to original SID running on a BeebSID 2.3 as I cant remember where I put it. The Swin SID ultimate would work too! And the FPGA SID is due any day now. The nice thing with any of the SwinSID (and I think the FPGA SID) is only 5v required. So no need to pull in 12v from the aux power connector. But as everything is build for 9v or 12v so not sure that makes much difference unless you redesign Beebsid for 5v and a SwinSID native. The SwinSID ultimate may not work, Prime reported he couldnt get SwinSID to work on Beebsid but not sure what version of SwinSID that was. I can only say nano works on Beebsid 2.4. Sorry if this has already been answered - is there a .SID player for the Model B - or some open source code used to play a .SID file that I can alter? Seems logical to me to be able to load .SID files directly. Not sure if its possible - depends on what that .SID machine code is doing with the CIAs and stuff and whether there's any basic references, or whether its simply spoon feeding the SID at (obviously at a different base address). That's not what I mean - I mean, it doesnt use the VDD pin! I've ordered some PCBs and will have a go, but provided it has 5v on the VCC pin, that's all a Nano Swin SID needs. No need to worry about the 9v and 12v - just not required. i plug it in, it works, beyon£ that I can say I am fussed. Or are you worried you Beeb psu on it’s last legs? No, not at all - just it makes it simpler to assemble. I prefer to keep the real SIDs in C64s lol. The SwinSID Ultimate is pretty close to perfect tbh, and I suspect the FPGA SID will be even better - again shouldnt need the 12v / 9v. The Nano Swin SID was very close but lacks OSC3 and ENV3 register read capability. So you want to tap 5v on the 1mhz interface and feed the power straight into the beebsid 5v supply and ignore all the 12v bits? Or are you still playing to draw the 5v from the aux connector? Edit: ooops was think of tube connector, no 5v on 1 MHz connector. Last edited by Elminster on Sun Jul 01, 2018 11:29 pm, edited 1 time in total. Yes, just take the 5v from the 1Mhz bus - there is 5v there on pin 1! Only 3 TTL chips to power, plus the Nano which doesn't consume a massive amount. Means I dont need the regulators and a few other things - the MOSFETs etc. Last edited by GadgetUK164 on Mon Jul 02, 2018 9:41 am, edited 1 time in total. The PCB layout abtually has edge connector "fingers" but they obviously decided to use the 2xn 0.1" cables instead. So there are 'extra' pins on the edge connector that aren't on the sockets. Although there is good reason to suspect that there was a plan to put +5V on pin 26 and then someone goofed with the layout. Got it working! Well, kind of... Killed a SwinSID Ultimate (argghhhhh!!!) in the process. At one point I was lacking 5v, and that appears to have killed that SwinSID =/ A bit gutted, but I might be able to get a replacement MEGA168PA yet - not sure until Máté gets back to me. One problem I ran into is what some others posted a number of pages back - the Super MMC seemingly not working well with it. The first pj disk works OK, provided I dont change tracks. The 2nd disk just won't play anything at all - giving the CHANNEL error, ie. drops to basic and just outputs CHANNEL over and over again on the screen. I gather that there's no solution because of where some of the SID code is located vs how the MMC DFS is allocating memory? What's the recommended SD / USB disk solution for the beeb, is it Datacentre? Last edited by danielj on Sat Jul 28, 2018 10:59 am, edited 1 time in total. I agree with Daniel, go for gotek, as not only can you use on beeb but it will work on other platforms as well, which I would think would be useful as you channel covers many platforms. Hopefully I have capture all the hardware in the hardware reference in my sig. Mmc is my least favourite, I also have gosdc, data centre and just about to build beebsid. I gosdc is my favourite but I suspect beebscsi May supersede it. Beebsid works with my gosdc, gotek. Not tried it with my data centre but 99% sure others have. Power wise I have dual 3.5 floppy connectors on external connector and dual 3.5 floppy connector spur internally of uprated power supply. This drives gotek, beebsid with spares. I have some Beeb SID black PCBs going spare if anyone wants one. £3 + postage (UK will be £2 probably), one per person. I've got about 5 or 6 for stardot members and the same for YT viewers. Please drop me a PM if you want one. And to clarify - its just the bare PCB! You would just need some resistors, connectors, jumpers, caps, sockets, resistor arrays (if terminating), and a SID. Last edited by GadgetUK164 on Thu Sep 06, 2018 10:30 am, edited 2 times in total. Watched. Interesting. After our discussions about where to get the power from, I am not surprised that the 5 volts ended up going astray, but didnt expect it to total the chip. I am guessing this probably wouldnt have been an issue on a real SID (no that I am going to try blowing one up to prove it). Good video, I did skip the construction bit as built 2 already. Flashy lights are a good idea, I think I need flashy lights. Thanks! It's annoying because if I had just measured the VCC pin on the socket before I installed the chip, I would have realised that I had forgotten to add a wire to bypass where I hadn't fitted the MOSFET. The good news is Mate has fixed the SwinSID Ultimate today =D It was just "lost firmware". Apparently something he noticed can happen if the VCC or ground are floating / making a bad connection on the socket. Last edited by GadgetUK164 on Thu Sep 06, 2018 2:33 pm, edited 1 time in total. Still more PCB's left if anyone wants one! Does anyone else want one of these boards? £3 plus postage (£2 UK). I'd quite like one but not sure I have the soldering skills! Ah why not. I'll take one! There are some left! Just drop me a PM! I finally have time to post some of these this week. There are still several left if anyone else wants one. £3 + postage (£2 UK) = £5 total for UK. Just in time for X-mas day! Has anyone tried a BeebSID on an Electron in conjunction with daveejhitchins PRES AP5 1mhz bus? Would that be workable / doable? I had a read through (well a quick skin really - theres nearly 10 years worth of thread to go at here) and noted the debate over 12v vs 5v and original SID vs SwinSID. I am guessing, if at all possible, the SwinSID would be a better option for the Electron? I would like to give it a go if you think it would be worth while. I would just need pointing in the right direction for the right bits and instructions. There's absolutely no reason why it wouldn't work with the Electron. The BeebSID (like all devices on the 1MHz Bus) requires external power so a 12V device would work just as well on the Electron as it does on the Beeb. The AP5 also has a 6522 on board - so any software that requires the 6522 timer (as music software often does) will also work on it. The main issue I think is software rather than hardware, as the menu/player system uses Mode 7. I can confirm it _can_ be done. I've finally done something with my AP5! Am I a little biased I need to get a second batch of AP5s on the go . . .